It's turning into Guest Interview Week here at TEV. Many thanks Daniel Olivas, who so ably moderated us this past Sunday, for contributing this fine guest interview with Lisa See. 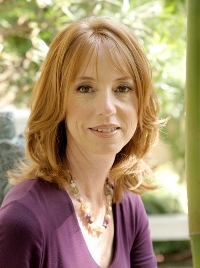 Lisa See is the author most recently of Peony in Love (Random House), which became an instant New York Times bestseller and won the Southern California Booksellers Award for best novel of 2007. Her last novel, Snow Flower and the Secret Fan (Random House), is being translated into 37 languages and has been optioned by MGM to be a motion picture. Her first book, On Gold Mountain: The One-Hundred-Year Odyssey of My Chinese-American Family (Vintage Books), a memoir/history of her Chinese-American family, was a New York Times Notable Book and national bestseller. The book became the basis for an opera produced by the Los Angeles Opera for which See wrote the libretto, and an exhibition that she curated for the Autry Museum of Western Heritage that then traveled to the Smithsonian Institution. She is also the author of three mysteries: Flower Net (Random House Trade), The Interior (Random House Trade), and Dragon Bones (Ballantine Books). DANIEL OLIVAS: For those readers who know your mother is Carolyn See but are unaware of your Chinese roots, can you describe your upbringing? LISA SEE: My mom is a writer and I never would have become a writer if it weren’t for her. My father’s side of the family is Chinese. My parents divorced when I was three. I lived with my mom, but I also spent a lot of time with the Chinese side of my family down in Chinatown. My mom and I moved around a lot, but the Chinese side of my family basically stayed put. My grandparents lived in my great-great-grandmother’s house. My aunts and uncles all worked in a store in Los Angeles Chinatown that had been in business since the 1890s. So in a sense, Chinatown was home base to me. It was the place that never changed and that felt like home. Of course it’s changed a lot by now, but I still have family there. I never thought too much about my identity. Who does, after all? But after I wrote On Gold Mountain, people started to ask me—and still do—“What are you, Chinese or American?” I know that because of how I look, I will always be seen as a bit of an outsider in Chinatown, but to me it’s home. It’s what I know. The same can be said for when I go to China. To me, it’s just a bigger Chinatown—very familiar and comfortable, but again, because of how I look I’ll always be considered an outsider. Then when I’m out in the larger white community in the United States, I look like I belong but sometimes I don’t feel like I do. That world can seem strange and foreign to me. So in writing these books I’m also trying to figure out who I am. Where do I fit in? Here, there, anywhere, nowhere? This quest doesn’t make it into the plots of the books. It’s just a journey I’m on as a person. But I’m not unique in this. Aren’t we all trying to figure out where we belong to some degree or another? OLIVAS: Do you view your new novel, Peony in Love, and your prior novel, Snow Flower and the Secret Fan, as your way of honoring your Chinese culture? SEE: I don’t think of it quite that way. I write stories that interest me. These two books happen to be historical novels. I wrote them because I stumbled across something that made me ask myself, “Why don’t I know that?” and “Why don’t we all know that?” In a sense, I became obsessed with the topic. Of course, I’m writing about Chinese culture too. This goes back to my last answer. Sometimes I’m trying to figure out what I know and what I don’t know. In my family, we had a lot of traditions for weddings, funerals, and one-month birthdays. When I’m writing, I get to find out why we do those things and what they mean, but I wouldn’t say it’s my main purpose. OLIVAS: Peony in Love takes place in 17th century China but the characters, in particular the young protagonist Peony, do not feel distant or really that different from us. In writing historical fiction, do you make a conscious effort to keep your characters from feeling like museum pieces? SEE: People don’t change all that much through time. All of us have mothers and fathers. All of us need to eat, sleep, procreate, breathe. But most important, we all share in certain emotions. The Chinese call them the seven ancestral emotions—joy, anger, grief, fear, love, hate, and desire. The Chinese believed that these emotions were so strong that they could cross the veil between life and death. But couldn’t you also say that these emotions are so strong that they stretch beyond boarders, time, and ethnicity? When I’m writing, I try to tap not only into those emotions but also those relationships that link us together from generation to generation. I try not to put my contemporary values on the characters. Often people ask me why I don’t come out more strongly against footbinding or how women were treated. I don’t want to do that. I just want to be in the room with my characters and let readers feel what those characters are feeling, experience what they’re experiencing, and hope that along the way the readers will come to their own conclusions. That said, Peony happens to have a rather contemporary outlook, all things considered. But I didn’t make that up. The real life Peony, whose name was Chen Tong, was a true product of her time. This flowering of women, women’s writing, and women going out and about in China lasted thirty years. OLIVAS: Your new novel is narrated by Peony, both before and after she dies. Why did you decide to have most of the book narrated by a ghost? Was this a challenging or liberating decision? To answer your second question, it was both! Spirits in the Chinese afterworld—whether beloved ancestors or hungry ghosts—have the same wants, needs, and desires as living people. They need clothes, food, a place to live. They have emotions. Most important, in the Chinese tradition, spirits, ancestors, and even demons are very much a part of everyday life. So for me the challenge was to create a believable situation for Peony. She can float, change form, and do many things that the living can’t do, but she is also limited—as all Chinese ghosts are—by things like corners, mirrors, scissors, and fern fronds. In other words, she inhabits a very real parallel world to the living world; both have their own rules of what can and can’t be done. Let’s take the inability to turn corners as an example. This belief permeates many facets of Chinese culture, including city planning, architecture, and landscape design. There are no straight lines to villages and towns, because even today no one wants to give ghosts a straight line to places where people live. In the gardens of wealthy homes and palaces, you see zigzag bridges, which are aesthetically beautiful but also have the practical purpose of preventing ghosts from crossing those bridges. But obviously Chinese ghosts have found ways to get around corners, otherwise there wouldn’t be Chinese ghost stories. I took those things that are traditionally harmful to ghosts and then had to figure out how Peony would overcome or work around them. Yeah, it was challenging. I mean, why should a fern frond be harmful to a ghost? Well, why should garlic be harmful to a vampire? Because it is, that’s why. But ghosts and vampires are pretty smart (or at least their writers are), and they always manage to get around these pesky inconveniences one way or another. OLIVAS: The lives of women in 17th-century China were so constrained in terms of marriage choices, travel, and even writing literature. Yet you tell us that some of these women went on to write some of the most revered poetry in China’s history. How do you reconcile this contradiction? SEE: In this one regard, imperial China wasn’t so different from the U.S. today. Right now we have conflicting views about what women should be like. On the far right, people believe women should stay at home, have babies, obey their husbands or fathers, and not have rights over their own bodies. Most Americans, however, believe women are entitled to equality at home and in the workplace. If you want to leave politics out of it entirely, we also have the so-called Mommy Wars—which is fought entirely by women against other women. One side believes that if you stay at home you’re a good mother and your children will be perfect. Anything less than that is ruinous to the child. The other side thinks that they can be better mothers by working and being out in the world. They think that the stay-at-home moms have given up their lives. Both sides feel superior and right. So why would it be surprising that there was a variation of this argument in China 300 years ago, or anywhere else in the world, now or in the past? But to answer your question more specifically, there were two schools of thought about women in mid-17th century China. Many followed the long-held Confucian belief that “an educated woman was a worthless woman.” But during this time, some men were interested in exploring the difference between li and qing. Li said that the only way to live in the world was through the rational thought; Qing, a purely female attribute, suggested that the only way to experience life was through the emotions, love in particular. Some men thought qing might be the way to go. (You could say this debate was a precursor to the whole Men Are from Mars; Women Are from Venus phenomenon.) Men wanted to experience life through emotions. More importantly, they suddenly wanted to know what women thought and felt. Women’s writings from this time period wouldn’t have survived to today if men hadn’t collected, read, and preserved what they wrote. But don’t you think men (sometimes?) want to know what women are thinking and feeling, just as women (sometimes?) want to know what’s going on with the men in their lives? Ummm…I’m still not sure I’ve answered your question. Let me take one more crack at it. The mid-17th century was a time of tremendous turmoil in China. The Manchus had invaded from the north, the Ming dynasty had fallen, and the Qing dynasty was established. In times of crisis—whether in the past or today—women and children are often the ones who suffer the most. During this time, women were sold like strings of fish. They had less value per pound than salt. Girls, who’ve never had much value in China, were sold to “thin horse traders,” who were like farmers, only instead of raising crops of wheat or rice, they raised crops of little girls. When the girls reached age thirteen, they were sold to become prostitutes, courtesans, concubines, or, if they were really lucky, to be the third or fourth wife of a very wealthy man. Meanwhile, in wealthy homes, men were so preoccupied by all the turmoil that they forgot to pay attention to their wives, daughters, mothers, and sisters. They left the door open, and those women went out. All of these women—no matter what their experience—had something to say. They no longer wrote about the butterflies and flowers they could see in their gardens. Rather, for the first time in Chinese history, they wrote about what was happening to them, what they could see, what they were experiencing. Men were completely entranced by these stories, which is why they collected and preserved them. But then, after about thirty years, society calmed down, the men came to their senses, and they said to the women, “Get back inside!” The doors were closed, and there women more or less remained in China until the mid-20th century. The Confucianists had prevailed: an educated woman was, once again, a worthless woman. OLIVAS: In your previous novel, Snow Flower and the Secret Fan, you described in great detail the horrific practice of footbinding and the manner in which the practice limited women’s lives. You touch upon that practice again in Peony in Love but not in as much detail. Oddly enough, footbinding in your new novel turns out to be a way for one girl to improve her lot in life. Why did you decide to explore the social benefits to footbinding? SEE: In both novels I gave footbinding about the same amount of space and in both novels footbinding was a way for girls to improve their standing in life. To me, the big difference had to do with point of view. In Snow Flower, I wanted to write about footbinding from a daughter’s perspective. I wanted to be in the room with her, feel what she was feeling—the terror, the pain, the accomplishment. It was a great example of the Chinese concept of mother love, a written character composed of two elements: love and pain. That certainly seemed to sum up how a little girl would view her mother, who had bound her feet. But even as I was writing that scene, I was thinking about the mother. I’m a mother myself, and I just couldn’t wrap my mind around how a mother could do that to her child. I began to think about mother love in a different way. I’d had so fixed in my mind from the daughter’s perspective, but as I thought about it I came to believe that mother love is really about what mothers feel for their children. When your children are little, you worry when they get fevers or chicken pox or whatever. You worry about them on the first day of school or if their friends gang up on them. My kids are older now and out on their own, but I worry about them much more than I did when they were little. They’re adults. I can’t do anything for them now, except feel their pain and worry about them. OLIVAS: In your Author’s Note, you describe your research for this novel which included travel to China. When did you decide that you’d done all the research you needed and that it was time to focus on writing the novel? SEE: I don’t know that I’m ever done researching. First of all, I LOVE doing the research. You could call me a research fanatic. For Peony in Love, I read everything I could on the three wives and I spoke with the top scholars in the field of Chinese women’s history. I also found first-person accounts of what happened during the Manchu invasion of Yangzhou. These were true stories of terrible suffering. In one of them a man said to his wife and daughters-in-law, “My stomach wants to go on eating for a few more years. You know what you need to do,” so those women sacrificed themselves—as was proper—to save the men in the family. I thought it would be interesting to take this true story and look at it from the women’s perspective. A whole separate part of my research had to do with ghosts and the need for sons, which are closely related. And of course, I went to China to every location that I wrote about. But how do I know I’m done? Sometimes because I get bored with reading the same thing over and over; sometimes because I’ve found something so extraordinary—like ghost marriages—that I know that I have to write about that and discard everything else; and sometimes I just have to force myself to stop and get to work. But I would say I keep doing research all the way through writing, editing, and even copyediting. Sometimes my editor or the copyeditor will ask a question that sends me back to the great search. OLIVAS: Are you going to return to China for your next novel or are you planning on something different? SEE: Yes and no. The new novel’s tentatively called Shanghai Girls. It starts in 1937 with two sisters in Shanghai. They come to Los Angeles in arranged marriages. (We often read about arranged marriages in other countries, but a lot of people don’t know that we had and still have them here in the U.S.) They live in a place called China City, which was built from the leftover sets from the filming of “The Good Earth.” So in some ways Shanghai Girls will be an exploration of what it means to be Chinese or American, and what is real and what is just façade. I’ll also be looking at the Confession Program, which took place in the 1950s, when the U.S. government targeted Chinese to try to get them to confess that they were here illegally and at the same time rat out their friends, family members, and neighbors as being Communists. In exchange for this, they’d be given American citizenship. My ambition is for Shanghai Girls to reveal a time and place that people know very little about, even though it happened right here in our country. Lastly, this is a story of two sisters. Every relationship between sisters, no matter how loving or close, is plagued by sibling rivalry: who’s prettier, richer, more talented, happier, the better mother? Your sister is the one person who should stick by you and love you no matter what, but she’s also the one person who knows exactly where to drive the knife to hurt you the most. I hope that every woman who has a sister will see the shared hopes, dreams, petty rivalries, and deep connections—for good and bad—that only sisters (and often best friends, who are like sisters) can have. Daniel Olivas is the author of five books and the editor of the forthcoming Latinos in Lotusland: An Anthology of Contemporary Southern California Literature (Bilingual Press), which brings together 60 years of Los Angeles fiction by Latino writers. He shares blogging duties on La Bloga which is dedicated to all aspects of Chicano literature. Olivas is a book critic for the El Paso Times and the MultiCultural Review. Thank you, Daniel, for the comment with this enclosed link. Thanks for posting this interview, Mark, most informative. Reminds me of the novel, 'Wild Swans' which I dipped into but not actually read cover to cover and which traces the roots of three Chinese women to China for three generations. This interview though brought to light some cultural ideas which are difficult to fathom :o). THis was an awesome interview! Thanks so much for posting it and for Daniel's excellent interviewing skills. As a fan of Lisa See's work, this was really interesting and informative to me. Thanks for the comments, folks. An interview is only as good as the subject's answers. Lisa was more than generous and patient with me.